Spurred on by speeches from famed film director Andrei Zvyagintsev and recently fired theater director Boris Mezdrich, hundreds of protesters gathered in front of a Novosibirsk theater Sunday to demand the ouster of Russian Culture Minister Vladimir Medinsky, local media reported. The Novosibirsk Opera and Ballet Theater has been mired in scandal for weeks over a modern rendition of the Wagner opera "Tannhäuser," which in part explored the life of Jesus Christ between the ages of 12 and 30, and featured scenes decried as sacrilegious by religious activists. After a regional religious leader complained about the play, administrative charges were filed against Mezdrich — the theater's director — and young opera director Timofei Kulyabin. A Novosibirsk court tossed out the case, but the theater's troubles didn't stop there. Last weekend, news broke that Medinsky had fired Mezdrich, who would be replaced at the theater by Vladimir Kekhman, a director who has in the past openly discussed his disregard for the beleaguered rendition of "Tannhäuser." In comments posted to the Culture Ministry's website in mid-March, Kekhman described Kulyabin's version of the opera as a "demonstration of internal godlessness." Mezdrich's firing was due to his failure to comply with instructions, state media reported at the time, citing the Culture Ministry. Days after Mezdrich was fired, the small CinemaUnion, a group existing independently of the Union of Cinematographers, called for Medinsky's resignation. A Change.org petition for him to resign had collected more than 6,000 signatures by Sunday evening. 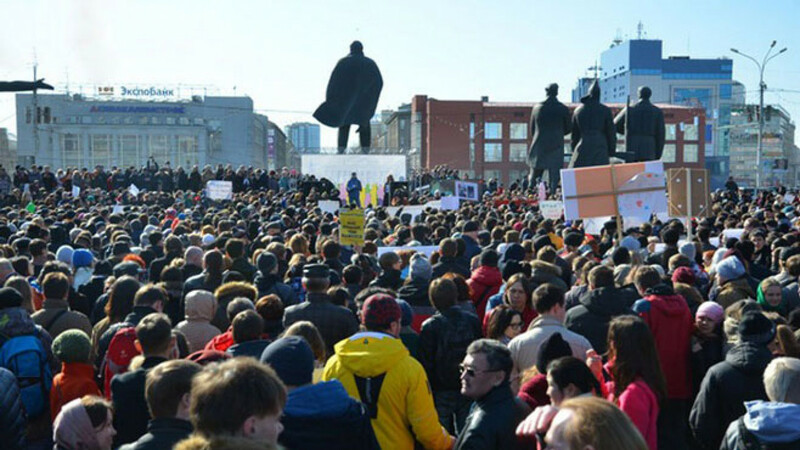 Organizers of Sunday's protest wrote in comments carried by news site FlashSiberia: "Novosibirsk is one of the cultural and theatrical capitals of Russia. We know culture better than Medinsky. … On Mezdrich's side is culture, the Constitution and the law. On Medinsky's is obscurantism, lawlessness and censorship." At Sunday's protest, Mezdrich told the crowd that "an artist has the right to creative freedom as much as there is the right to freedom of religion," FlashSiberia reported. Zvyagintsev, who also courted controversy with his 2014 film "Leviathan," a tale of a Russian homeowner standing up to a corrupt mayor that was widely acclaimed in Europe and the United States, but broadly derided by Medinsky and other officials at home, told Sunday's crowd via a video link that "the viewer is free to hear what he wants to hear." Local police estimated that about 300 protesters had turned out for Sunday's event, while Yabloka party leader Sergei Mitrokhin estimated some 5,000 people had gathered. FlashSiberia reported that the number stood at about 1,000.